Diaa Bekheet | Washington, DC – World-renowned jazz keyboardist and composer Yanni is planning a four-month tour of the United States and Canada. “An Evening With Yanni” will take him to 15 states in the North, East, West and South. 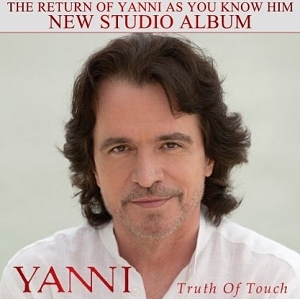 Lauded as the top New Age artist of 2011, Yanni will play songs from his most recent album Truth of Touch. It is his first album of original music in years and was the top-selling New Age album of 2011. The tour starts on April 17. From The Acropolis in Greece to the Forbidden City in China and the Taj Mahal in India, the Greek artist has made quite a name for himself. Multi-talented Yanni was born in Kalamata, Greece in 1954. He grew up on the shores of the Mediterranean. Young Yanni’s passion was swimming and listening to music. At the age of six, Yanni would reproduce on the family piano, what he was hearing on the radio or gramophone. He refused to take piano lessons and could not read music at the time. The family spent a lot of time playing music and singing together. As a child, Yanni was also a talented swimmer. In fact, he broke the Greek National swimming record for the men’s 50-meter freestyle event at age 14. Yanni left Greece to college in the United States. During that time, he played with various rock and roll bands. The musician credits that experience with helping him develop his own original music style. After graduating from the University of Minnesota in 1976 with a B.A. in psychology, Yanni moved to Los Angeles in pursuit of work on movie soundtracks. In 1987 Yanni established a band that included pianist/singer John Tesh and drummer Charlie Adams. The band traveled on several tours to promote his earliest instrumental albums, Keys to Imagination, Out of Silence, and Chameleon Days. I featured Yanni three times on my Jazz Club USA show that aired on VOA in the 1990s. At the time, he was nominated for a Grammy in the Best New Age Album category for “In My Time” in 1994 and for “Dare to Dream” in 1993. The music follows Arabic narration. Yanni skyrocketed to fame after a live concert at the centuries-old Herod Atticus Theater in Athens in September 1993. The show, Yanni Live at the Acropolis, was simultaneously televised all around the world. More than 500 million people watched the live concert in 65 countries. I was among those viewers and decided to feature the concert in a special program for my Middle Eastern audience. Yanni Live at the Acropolis was released in 1994 as an album and a video. It was his first live album recorded with a full orchestra directed by Iranian conductor, Shahrdad Rohani. Yanni‘s own core band accompanied him. The album remained No. 1 on the charts for a long time and became the second best-selling music video of all time. It sold over 7 million copies worldwide. Since then, Yann’s music has been used extensively in television shows and televised sporting events, including the Super Bowl, Wide World of Sports, U.S. Open, Tour de France, the World Figure Skating Championships and the Olympic Games. Here’s a show reviewing his album Winter Lights in 1999. Music follows Arabic narration. Yanni has recorded a total of 16 albums. They include live concerts on CDs and DVDs. His world tours continue unabated. In the past 10 months, Yanni has performed in 60 concerts throughout the USA and in Canada, Mexico, Argentina, Brazil, Chile, Puerto Rico and Panama. He still has another 140 worldwide concerts scheduled for this year. One of his most popular concerts was last month’s “Yanni Live at El Morro” in San Juan, Puerto Rico. Diaa Bekheet has worked for a host of media outlets, including Radio Cairo in English, ETV News, Deutsche Presse-Agentur (dpa) and the Associated Press. He joined VOA in Feb. 1989 as an International Broadcaster, hosting a variety of popular news and entertainment shows such as Newshour, Radio Ride Across America, Business Week, and Jazz Club USA. He has interviewed a number of Jazz celebrities, including the legendary Dizzy Gillespie, Ramsey Lewis, Wayne Shorter, and George Benson. Diaa is currently an editor for our main English site, VOAnews.com. I have seen Yanni’s concerts a number of times and each one has left a wonderful lasting impression on me. He and his talented orchestra and vocalists consistently provide an excellent concert experience. I love the addition of the outdoor venues to this summer’s tour and plan to attend some of them. A concert not to be missed! Can’t wait! Best concert i have ever been to! He saved my soul! A MUST BUY!! MUST SEE!! i´ve had the chance to see Yanni live five times in one year. I am also getting ready to take a flight to the US for 4 more concerts in April of 2012 and I must say that the times I´ve spent at his concerts are the some of the best moments of my life in the past years! And there is more to come! If you get the chance, do not miss his concert!! I have seen his live concert an it is something so different that his records. Yanni is just awesome. Yes live concerts are always different and usually I would say better than records, but Yanni is really exceptional in this.